Here is one that goes the extra mile. 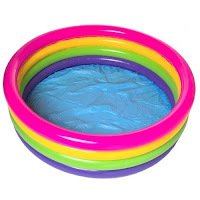 You need a baby pool filled with the stuff of your choice (oatmeal, instant potatoes, whatever you can get your hands on) and a 4x4 plank of wood long enough to reach across your pool (prop up the ends so the pool is not crushed). This must be sturdy enough to hold two People. Two contestants with Nerf joust sticks (possibly pool noodles) and helmets battle on the plant to knock each other off into the pool. A ton of preparation is needed for this one. Should only be done outside. This could be a fun game, but you must think through the safety on this one. Make sure the board doesn't get so slippery that the kids will fall and get hurt. You might even want gymnastic mats around the pool.